"I have a very blessed life," Tom Petty says. "I think any time you're making a living at what you love to do, you're blessed. That's what I try to instill in my kids. Go after what you really love and find a way to make that work for you, and then you'll be a happy person." On this sunny spring afternoon at his Malibu beach house, sitting yards away from the Pacific Ocean, Petty appears to be pretty happy. What he loves to do--and has been doing for more than 40 years--is make music. He and his band, the Heartbreakers, are getting ready for a major tour through 45 cities, coast to coast. Petty and company will play songs from their first new album in eight years, Mojo, on which they dive into the blues and add a splash of reggae, along with the melodic rock that has taken them to the top of the charts time and time again. Since 1976, he and his band have been known for hits such as "Breakdown," "Don't Do Me Like That," and "Free Fallin'" and for accumulating sales of more than 50 million albums. In 2002, they were inducted into the Rock and Roll Hall of Fame. Over the years, Petty has played with the greats: George Harrison, Roy Orbison, Bob Dylan, Johnny Cash, Stevie Nicks. For the past five years, he has also had a weekly show, Buried Treasure, on the SIRIUS XM satellite radio network. "I play what I want to play and say what I want to say. It's a labor of love. The feedback I get is so rewarding. I get such nice mail: people remembering things or discovering things. A teenage girl wrote me saying she'd never heard of Chuck Berry. I couldn't believe it. It's so rewarding to be passing that music on to people." 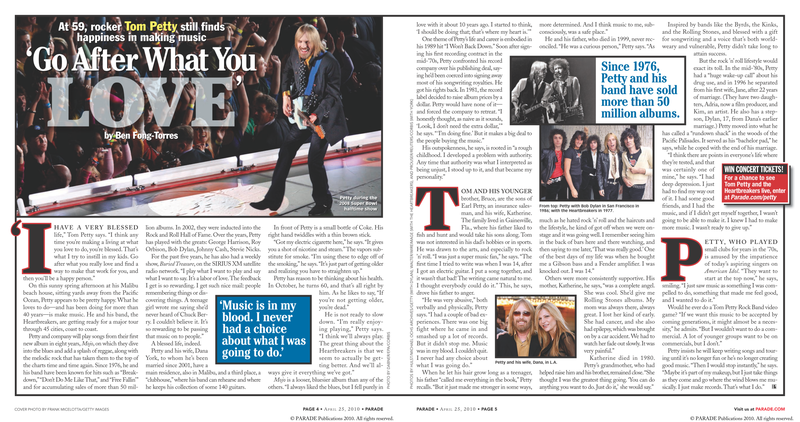 Petty and his wife, Dana York, to whom he's been married since 2001, have a main residence, also in Malibu, and a third place, a "clubhouse," where his band can rehearse and where he keeps his collection of some 140 guitars. In front of Petty is a small bottle of Coke. His right hand twiddles with a thin brown stick. "Got my electric cigarette here," he says. "It gives you a shot of nicotine and steam." The vapors substitute for smoke. "I'm using these to edge off of the smoking," he says. "It's just part of getting older and realizing you have to straighten up." Petty has reason to be thinking about his health. In October, he turns 60, and that's all right by him. As he likes to say, "If you're not getting older, you're dead." He is not ready to slow down. "I'm really enjoying playing," Petty says. "I think we'll always play. The great thing about the Heartbreakers is that we seem to actually be getting better. And we'll always give it everything we've got." Mojo is a looser, bluesier album than any of the others. "I always liked the blues, but I fell purely in love with it about 10 years ago. I started to think, 'I should be doing that; that's where my heart is.'" One theme of Petty's life and career is embodied in his 1989 hit "I Won't Back Down." Soon after signing his first recording contract in the mid-'70s, Petty confronted his record company over his publishing deal, saying he'd been coerced into signing away most of his songwriting royalties. He got his rights back. In 1981, the record label decided to raise album prices by a dollar. Petty would have none of it--and forced the company to retreat. "I honestly thought, as naive as it sounds, 'Look, I don't need the extra dollar,'" he says. "'I'm doing fine.' But it makes a big deal to the people buying the music." His outspokenness, he says, is rooted in "a rough childhood. I developed a problem with authority. Any time that authority was what I interpreted as being unjust, I stood up to it, and that became my personality." Tom and his younger brother, Bruce, are the sons of Earl Petty, an insurance salesman, and his wife, Katherine. The family lived in Gainesville, Fla., where his father liked to fish and hunt and would take his sons along. Tom was not interested in his dad's hobbies or in sports. He was drawn to the arts, and especially to rock 'n' roll. "I was just a super music fan," he says. "The first time I tried to write was when I was 14, after I got an electric guitar. I put a song together, and it wasn't that bad! The writing came natural to me. I thought everybody could do it." This, he says, drove his father to anger. "He was very abusive," both verbally and physically, Petty says. "I had a couple of bad experiences. There was one big fight where he came in and smashed up a lot of records. But it didn't stop me. Music was in my blood. I couldn't quit. I never had any choice about what I was going do." 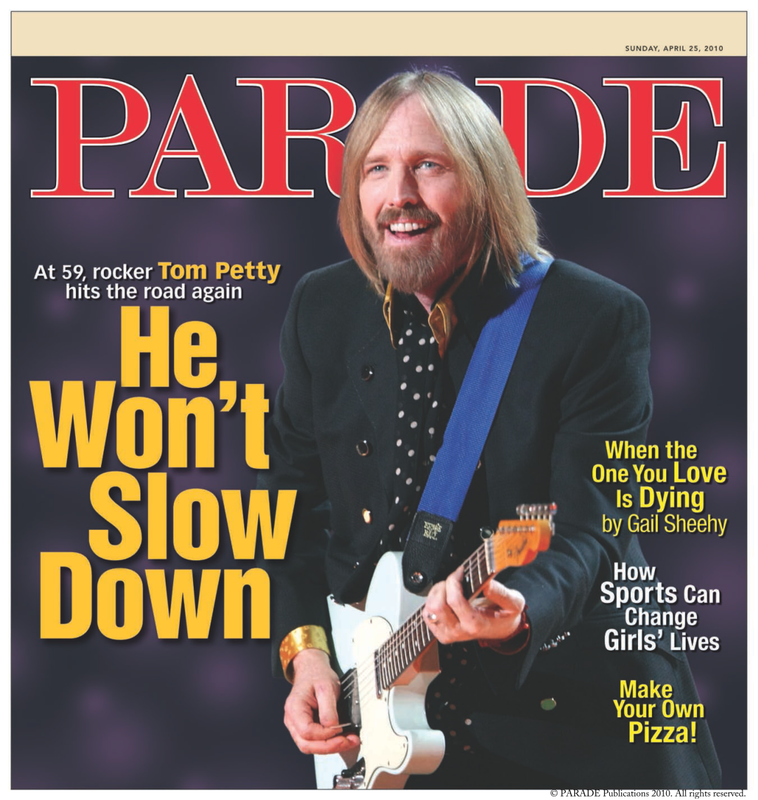 When he let his hair grow long as a teenager, his father "called me everything in the book," Petty recalls. "But it just made me stronger in some ways, more determined. And I think music to me, subconsciously, was a safe place." He and his father, who died in 1999, never reconciled. "He was a curious person," Petty says. "As much as he hated rock 'n' roll and the haircuts and the lifestyle, he kind of got off when we were onstage and it was going well. I remember seeing him in the back of bars here and there watching, and then saying to me later, 'That was really good.' One of the best days of my life was when he bought me a Gibson bass and a Fender amplifier. I was knocked out. I was 14." Others were more consistently supportive. His mother, Katherine, he says, "was a complete angel. She was cool. She'd give me Rolling Stones albums. My mom was always there, always great. I lost her kind of early. She had cancer, and she also had epilepsy, which was brought on by a car accident. We had to watch her fade out slowly. It was very painful." Katherine died in 1980. Petty's grandmother, who had helped raise him and his brother, remained close. "She thought I was the greatest thing going. 'You can do anything you want to do. Just do it,' she would say." Inspired by bands like the Byrds, the Kinks, and the Rolling Stones, and blessed with a gift for songwriting and a voice that's both world-weary and vulnerable, Petty didn't take long to attain success. But the rock 'n' roll lifestyle would exact its toll. In the mid-'80s, Petty had a "huge wake-up call" about his drug use, and in 1996 he separated from his first wife, Jane, after 22 years of marriage. (They have two daughters, Adria, now a film producer, and Kim, an artist. He also has a stepson, Dylan, 17, from Dana's earlier marriage.) Petty moved into what he has called a "rundown shack" in the woods of the Pacific Palisades. It served as his "bachelor pad," he says, while he coped with the end of his marriage. "I think there are points in everyone's life where they're tested, and that was certainly one of mine," he says. "I had deep depression. I just had to find my way out of it. I had some good friends, and I had the music, and if I didn't get myself together, I wasn't going to be able to make it. I knew I had to make more music. I wasn't ready to give up." Petty, who played small clubs for years in the '70s, is amused by the impatience of today's aspiring singers on American Idol. "They want to start at the top now," he says, smiling. "I just saw music as something I was compelled to do, something that made me feel good, and I wanted to do it." Would he ever do a Tom Petty Rock Band video game? "If we want this music to be accepted by coming generations, it might almost be a necessity," he admits. "But I wouldn't want to do a commercial. A lot of younger groups want to be on commercials, but I don't." 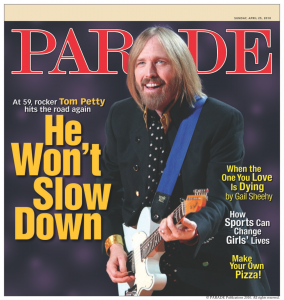 Petty insists he will keep writing songs and touring until it's no longer fun or he's no longer creating good music. "Then I would stop instantly," he says. "Maybe it's part of my makeup, but I just take things as they come and go where the wind blows me musically. I just make records. That's what I do." In this week's issue of PARADE, Ben Fong-Torres talks to rocker Tom Petty about finding happiness in making music. Plus, why he's showing no signs of slowing down. In the web exclusive below, Petty names some high points of his long, illustrious career in rock music. The best shows aren't always the biggest. "I've had a career that I'm so humbled by. There've been so many great moments on stage; it's hard to pick one. Sometimes it's the oddest gig; in the middle of nowhere. Some of them are small moments." "I got to jam with Muddy Waters once. This was in 1981, and it was at a little club in Phoenix. We had played the big arena and heard Muddy was at this club, so we went straight there to hear Muddy. Someone from his camp came out and said, 'Muddy would like to see you backstage and meet all of you.' It was strange. But he'd married a girl from Gainesville, and he knew all about us. He said, 'Let's play' (on his encore)...So we were walking out to play, and I said, 'What are we gonna play, Muddy?' He said, 'Let's play some blues.' We had such a good time. We left there floating on a cloud." "And I had a thing not long ago with J.J. Cale at McCabe's (a folk music club in Los Angeles). 'Come on down.' He knew Mike Campbell, our guitarist. We practiced a number, and J.J. said, 'When you come up there, stay there; don't leave.' We stayed and had this marvelous time. I left there feeling really great about things, and I think it had a lot to do with this new album (Mojo). He played with such a loose structure to everything, but it worked like crazy. So I found myself playing songs for the first time but really getting a big bang out of it. I looked at the way he structured his songs, and I took a lot of that back to my record. He plays a song once, verse and chorus, and everybody falls into it. And the rest of it is how you express yourself." "Bob Dylan had a huge influence on us. We worked with him in 1986, backing him up, and we're just forever in his debt. He gave us a whole different way to open the music up. He gave us a lot more confidence on stage, too. Some of the things were really bold, too. We'd have to play stuff we'd just learned. He went for the feel of things; 'If this is feeling good I don't worry about dotting the i's and crossing the t's.' I saw his music very much like jazz or blues; it was very free. It made us want to be a bit bolder on stage, maybe improvise more." It had an effect on my writing, too. I wanted it to be a wider thing, where you could take it in on many levels and it would still work. Hard to explain. But we were different after we did that."